In fact, in 2017 alone, our city saw a significant increase in infected elms, with over 8,000 reported cases (up from an average of approximately 5,000 per year), and there are no signs of the disease slowing down anytime soon. As a homeowner or business owner, it is useful to be aware of how Dutch Elm Disease is spread and how you can help prevent it, in order to protect and preserve our beautiful trees. Dutch Elm Disease (DED) is a fungal disease that blocks water movement in elm trees, resulting in their death. 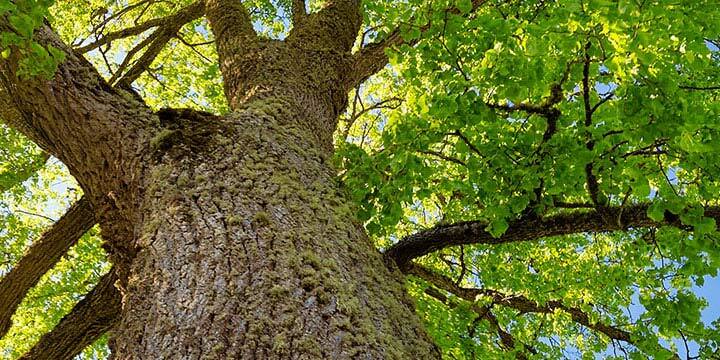 Once an elm tree has contracted the disease, the time to its death can be relatively swift, with small elms possibly dying within a few months and larger elms dying within 1-2 years. American elms are the most susceptible to DED. Siberian elms are almost 100% resistant, but it is occasionally possible for them to catch the disease as well. How is Dutch Elm Disease spread? In the summertime, female elm bark beetles use stressed, unhealthy or diseased elm trees to produce their offspring. This new generation of beetles emerges from these trees carrying the disease-causing fungus on their bodies. In fall, they burrow into the lower trunks and root flares of healthy elms to overwinter under the bark. The beetles will then emerge again in early spring, still carrying the fungal spores, and spread to nearby trees to feed. As the beetles feed on the canopy of healthy elms during the spring and summer, the fungal spore is exposed tissues in the branches. New generations of elm bark beetles are produced, and the cycle begins again. How do I recognize Dutch Elm Disease? If an elm is infected with Dutch Elm Disease during the previous season, it may produce smaller leaves the following spring. If the elm is infected within the same growing season, you may notice wilting leaves, usually in the upper canopy during the summer. Leaves will then turn yellow, then brown and curled, sometimes remaining on the tree as they do so. How do I prevent Dutch Elm Disease? It is very important to practice prevention because once an Elm has contracted Dutch Elm Disease, it can’t be pruned out and fungicide is no longer effective. The best ways to prevent the spread of Dutch Elm Disease is to make sure your elm is happy and healthy. You can do this by watering your trees during periods of drought, pruning and deadwooding every few years (with no more than 8 years between prunings), and by applying deep root feed fertililization for a strong, healthy tree root system. Therapeutic injection of elms with a registered fungicide every 1 to 3 years also provides an excellent defence against DED. Injections are done by drilling small holes into the root flares to administer the fungicide. At Kildonan Tree Service, we use Arbortec 20S fungicide because it is highly resistant to degradation and can protect your elm trees for 2.5 to 3 years. In Manitoba, it is a violation to prune your elm trees between April 1st and July 31st. That’s because pruning in this time make the trees vulnerable to elm bark beetles, which contribute to the disease being spread. You should therefor book your elm tree pruning before March 31st or after August 1st to ensure they are best protected. Contact Kildonan Tree Service today to book your elm tree pruning*, fertilizer injection or inoculation. *Elm trees in Manitoba may only be pruned between August 1st and March 31st. No pruning may take place from April 1st to July 31st. Next PostNext Spread the Love: Your Trees Need Fertilizer too!